I believe we all have a special dream tucked away in our heart, that we keep secret. It is a dream that gives us a purpose in our life. A dream that grows within our heart as we move through life. Even though at times we may doubt and fear, the secret dream keeps us moving forward. Great things happen when we let our dream blossom within our heart. Pain, sorrow, and anguish from failures just fade away like magic, as we embrace our secret dream. Our dream gives us the strength to walk tall, and makes us feel like champions. The power that comes from the dream in our heart gives us the feeling, "Yes I Can"! Our path through life can be bumpy and full of pot holes. Our belief in the secret dream we hold in our heart will give us wings to carry us over the obstacles we face in our life. What ever the dream is you carry your heart, do not let it die. 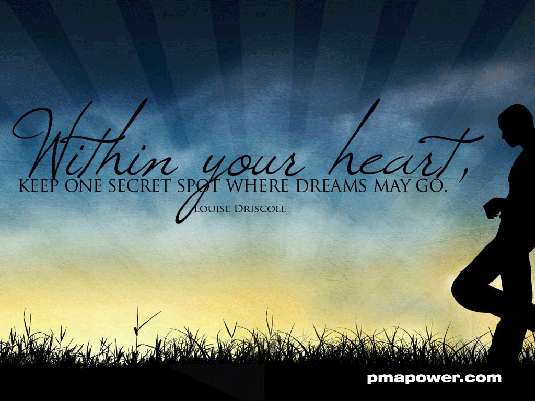 Keep the secret dream in your heart alive, and never give up!